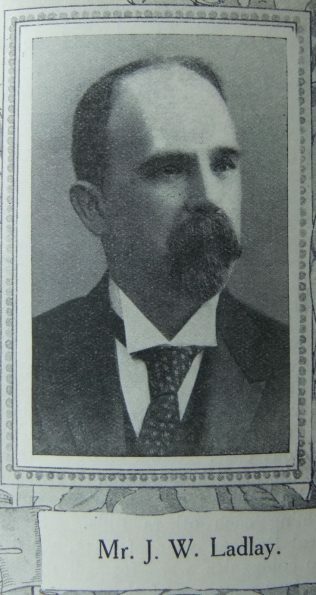 Mr. John W. Ladlay, steward of Leeds 9th, represents a third generation of Primitive Methodists, and has been a member over forty years, and in official life for over thirty years. Trustee for five Chapels, he rendered invaluable service as secretary during the erection of three of them. Has been a member of three District Committees, and has devoted his many gifts to every office in his Church except that of Local preacher. Unable or unwilling to accept honours his brethren have offered him his first appearance at Conference was at Tunstall in 1910. At duty or devotions he can be relied upon; is genial and generous; painstaking and devoted; an able financier, a born leader; zealous in labour, and of cheerful and courageous spirit. Many years ago he became a systematic and proportionate giver. He is a keen, active, successful commercial man, enthusiastically devoted to Christ and his own Church. John was born in 1855 at West Hartlepool, Co. Durham, to parents William and Ruth. William was a greengrocer (1861) and later a boilersmith. Census returns give the following occupations for John. John married Sarah Ann Yarwood (abt1857-1929) in late 1879 at Stockton, Co. Durham. Census returns identify five of six children. John died on 19 April 1925 at Leeds, Yorkshire.